We are an oatmeal-cooked-overnight-in-the-slow-cooker kind of family. It's sorta become an obsession over the past few years. We love waking up to a hearty breakfast awaiting us - especially on busy mornings. I've shared with you several variations on my basic recipe like, my carrot cake version (my personal favorite). 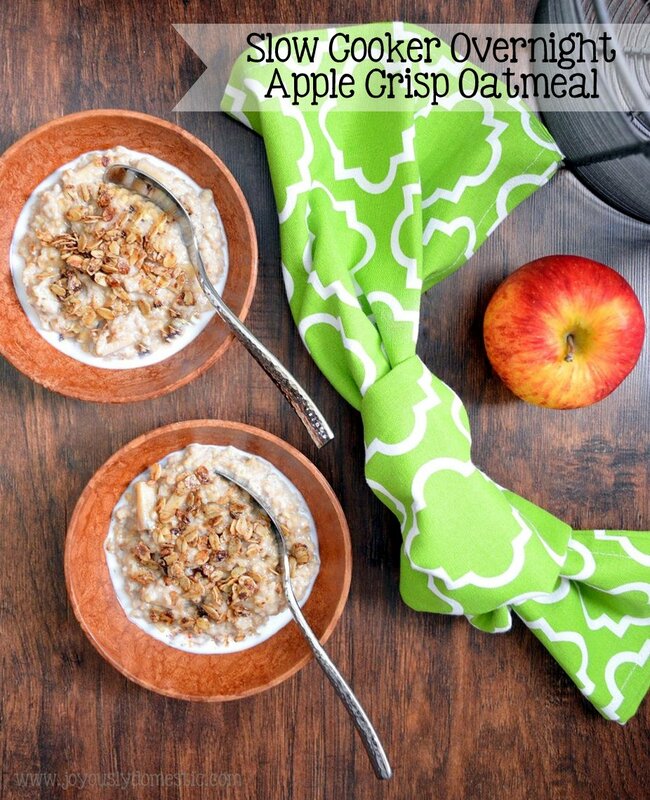 I wanted to incorporate apples and warm, fall-inspired spices in my newest version of cooking steel cut oats in the slow cooker. But, I, also, wanted there to be a twist. My mind went to apple crisp, a dessert that I make often for my family. The premise of this recipe is to start with steel cut oats (I really don't recommend cooking any other type of oats overnight in the slow cooker ... unless you want totally mushy oatmeal). Then, a few basic ingredients like, milk, water, brown sugar and butter get stirred in. Warm, fragrant spices like, cinnamon, ginger and nutmeg are stirred in. Chunks of crisp apple are then added before lidding the slow cooker as you head off to bed. I do top this at the time of service with an apple crisp-style topping that I make a bit prior to starting the oatmeal in the evening. (The crisp topping takes about 40 minutes to bake, but only a few minutes to prep.) It is totally optional, but therein lies the "crisp" part of the recipe. Alternatively, some store-bought basic granola could be sprinkled on top if you don't wish to make the topping from scratch. NOTE: I cook this oatmeal in a metal bread pan that fits perfectly down into my oval slow cooker. I loosely crumple up a piece of foil, place it on the bottom of the slow cooker insert, pour in about four cups of hot water and place the bread loaf pan atop the foil. A steam effect is created. Following this method ensures that the oatmeal does not burn and clean-up is a lot easier. This, also, ensures that the oatmeal stays moist and very creamy. Coat a bread loaf pan or similar vessel (see NOTE above) with non-stick spray. Set aside. Loosely crumple up a large piece of foil. Place in the center of the slow cooker insert. Pour about four cups of hot water into the bottom of the insert (around the foil). Sit bread pan on top of crumpled foil. Gently combine together all ingredients for the oatmeal portion of the recipe in the pan. Lid. Cook on warm for up to eight hours or on low for up to five hours. Stir and serve in bowls topped with the crisp topping (directions below) or crunchy granola. Serve with a drizzle of heavy cream or whole milk if desired. Serve with maple syrup, honey or additional brown sugar as desired. Store leftovers in refrigerator. Preheat oven to 275 degrees. Line a large sheet pan with foil. Sprinkle oats and nuts evenly onto pan. Sprinkle nutmeg, cinnamon, ginger, salt and brown sugar evenly across oats/nuts. Drizzle melted coconut oil and 3 tablespoons of honey across oats/nuts. Stir to evenly coat mixture. Bake for 30 - 40 minutes or until mixture is beginning to become dry and slightly crunchy. Stir a few times during baking. Remove from oven, drizzle on remaining 2 tablespoons honey, stir gently and allow to cool. Once cooled, store in airtight container until needed. Serve sprinkled atop oatmeal.